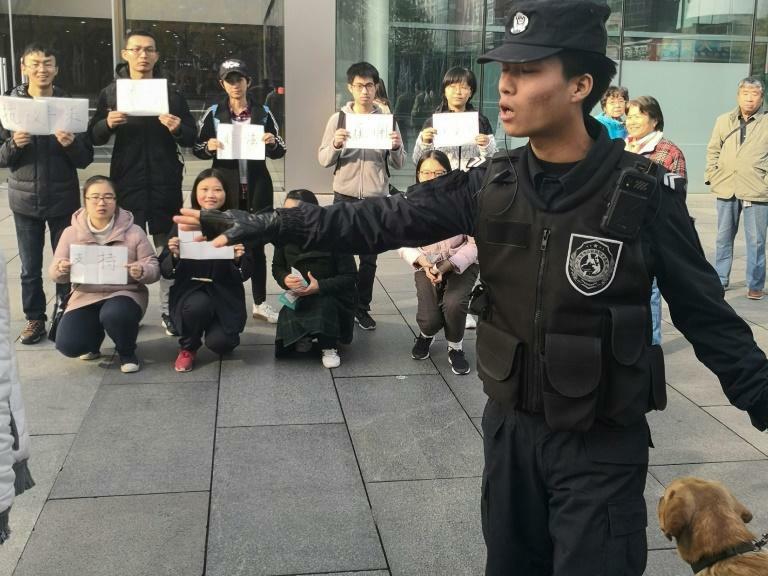 Beijing police Thursday briefly detained two students who were part of a group protesting alleged worker exploitation outside an Apple store, according to one of the demonstrators. The group was protesting in response to allegations made last month that one of the US company's suppliers was exploiting student workers in southwest China. The two held were from Renmin University and Peking University -- two schools that have seen a surge of student-led labour activism this year. One of the other protesters, a 21-year-old from Renmin University, told AFP that a group of police ordered the students to show their IDs shortly after they finished taking photos in front of the Apple store. A total of 10 students participated in the protest. "They said we were disrupting the order, disrupting law and order, and asked to check our IDs," said the student, who requested anonymity. After the protesters initially refused to show their identification cards, the police took the two away, she said. They were later released at about 8:00pm (1200 GMT) after police questioned them about the protest, the source said. Teachers from their respective universities then escorted them back to school. According to photos shared on Twitter by eyewitness Zhifan Liu, a French freelance journalist based in Beijing, the students were holding signs denouncing "illegal" student employment at an Apple factory and in support of workers being allowed to form unions. The students had planned to take photos and shoot a video to raise awareness around the alleged exploitation of student workers at an Apple Watch factory in Chongqing municipality. According to a report published last month by Hong Kong-based labour rights group Students and Scholars Against Corporate Misbehaviour (SACOM), students from a vocational school had to work punishing hours at the factory, assembling Apple Watches -- under the guise of "internships" -- or else their degrees would be withheld. The Chongqing factory is operated by Quanta Computer, a Taiwanese electronics manufacturer, and also produces devices for other brands. Apple has said it is investigating the allegations. An Apple spokeswoman declined to comment on Thursday's protest. Student activists from top Chinese schools are rallying behind labour rights and unions despite crackdowns by universities and the police this year. Many belong to Marxist societies or student groups -- some of which have struggled to register officially with their schools as universities try to rein in labour activism. In August, a police raid swept up student activists in Guangdong province, according to the official website of the Jasic Workers Solidarity group. The students were there to support workers from Jasic Technology, a welding machinery company, who were trying to form their own union. According to the Jasic Workers Solidarity group, which the student activists were members of, the police beat students and confiscated their phones during the raid. Yue Xin, a Peking University student who co-authored a petition demanding details of a sexual abuse case at the school, was detained during the August police sweep and has not been heard from since.